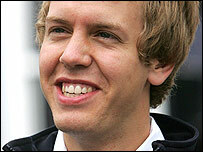 Toro Rosso Formula One team have axed Scott Speed and replaced him with BMW's third driver, Sebastian Vettel. The 20-year-old became the youngest driver to win F1 points when he drove for BMW Sauber in the US Grand Prix in place of the injured Robert Kubica. Vettel raced karts for the Red Bull Junior team before driving for BMW in Formula Three. Speed's future had been in doubt after an angry row with team chief Franz Tost after the European Grand Prix. BMW team chief Mario Theissen said once the German driver received the offer, there was no way they could stand in his way. "As our test and reserve driver Sebastian has carried out sterling work for us," he said. "When he stood in for Robert Kubica in the USA Grand Prix he made history by becoming the youngest debutant to earn a world championship point. "However, the current testing rules mean that he barely gets a chance to drive for us. "Now he has been offered the opportunity to get inside a Toro Rosso cockpit. "We have sponsored and coached Sebastian over a number of years. "To place obstacles in his career path now would go against our concept of talent promotion." Follow live coverage of the Hungarian Grand Prix on this website and BBC Radio Five Live. Qualifying starts at 1300 BST on Saturday, with the race 24 hours later.